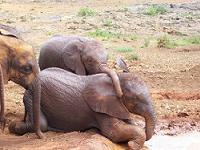 The David Sheldrick Wildlife Trust is a small, flexible charity, established in 1977 to honour to memory of a famous Naturalist, David Leslie William Sheldrick MBE, the founder Warden of Tsavo East National Park in Kenya, where he served from its inception in 1948 until his transfer to Nairobi in 1976 to head the Planning Unit of the newly created Wildlife Conservation & Management Department. David died 6 months later but his legacy of excellence and the systems he installed for the management of Tsavo and wildlife generally in Kenya, particularly in the sphere of wildlife husbandry and ethics, lives on. The Trust has played an extremely significant role in Kenya’s conservation effort since it was founded in 1977, speaking out when necessary on controversial issues and stepping in unobtrusively and rapidly to bridge a gap or meet a shortfall that jeopardizes wildlife during times of Governmental economic constraints. 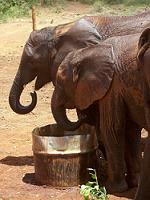 Because in life David Sheldrick strongly censored the extravagance of exorbitant overheads, the Trust places great emphasis on minimal expenditure in this respect, thereby ensuring that donations given in support of wildlife reach their target in full in the most practical and positive manner. The reputation of the Trust is a proud one, as was the record of the man whose name it bears, thanks to the dedication and energy of a competent Staff committed to the example of David Sheldrick as their role model. The Trust was the pioneer of Kenya’s very effective conservation strategy to retrieve the highly endangered Black Rhino from extinction, something that has been emulated elsewhere in Africa. It masterminded the concept of electrically fenced enclosures within the Protected Areas so that outlying survivors of the species could be concentrated for breeding purposes. Aside from purchasing Crates and constructing Relocation Holding Stockades, the Trust was instrumental in the establishment of Kenya’s first enclosed Rhino Sanctuaries in Tsavo West and Lake Nakuru National Parks. It also pioneered the free release of excess animals from these Sanctuaries into Tsavo East, mindful of the fact that should security collapse (as it has in the past), enclosed rhinos are more at risk than those living free. The Trust also pioneered the successful hand-rearing and complicated strategy of successful rehabilitation back into established wild rhino communities of orphaned Black Rhino calves. Its expertise has been responsible for saving many orphaned rhino calves on Kenya’s Private Ranches as well as elsewhere in Africa. It’s hands-on practical experience and inside knowledge of this species is unmatched. 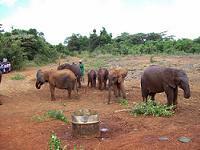 I’ve been to the David Sheldrick Wildlife Orphanage a couple of times and looking forward already to the next. It’s going to be a special visit as I’m hoping to be able to see and spend a little bit of more personal time with the little ellie Sinya that I started fostering in 2007. When you become a foster parents you will get the opportunity to spend some extra time after normal visiting hours and bond with your foster 'child'. You will also learn more about the work and fantastic things this charity does. During normal visit hours you can see the orphans getting some milk, play in the mud and sometimes they come so close to this little rope, that keeps the human visitors in check, that you can give them some little scratchies, specially the little ones. Oh so precious! The same can be said of Elephants, for the Trust can claim another important first. Daphne Sheldrick was the first person in the entire world to successfully hand rear newborn fully milk dependent African Elephant orphans, something that spanned 28 years of trial and error to achieve. By the year 2004 the Trust had successfully saved and hand-reared over 55 infant African Elephant calves, two from the day of birth. Currently, over a dozen of the Trust’s hand-reared elephants are fully established and living free amongst their wild peers in Tsavo, some returning with wild born young to show their erstwhile human family. 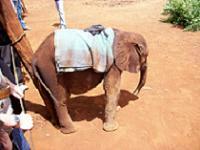 Based at two established Elephant Rehabilitation Centres within Tsavo East National Park others are still in the gradual process of re-integration with yet others in early infancy at the Trust’s Nairobi National Park Elephant and Rhino Nursery. 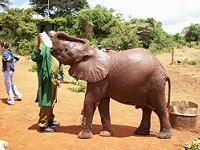 The Trust has trained a team of competent Elephant Handlers who replace the orphans’ lost elephant family until such time as the transition to the wild herds has been accomplished, something that can take up to l0 years, since elephant calves duplicate their human counterparts in terms of development through age progression. Those that were orphaned too young to recall their elephant family remain dependent longer, but all the Trust’s orphans eventually take their rightful place amongst their wild counterparts, including those orphaned on the day they were born. 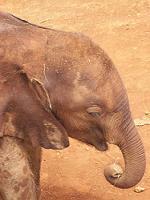 On an International level, and in the interests of elephant conservation generally, the David Sheldrick Wildlife Trust pursues an aggressive ongoing campaign to exert public pressure on The International Convention for Trade in Endangered Species (CITES) to maintain the International ban imposed on the sale of Elephant Ivory in 1989 and also to disallow sales of Southern African ivory stockpiles. As long as there is a market for carved ivory trinkets, the elephants of Africa will continue to be cruelly killed for their teeth.